I love all shades, tones and hues of blue-green. There’s an old saying, “Blue and green should not be seen without a colour in between.” Well, Bah Humbug to that. Just look how well Mother Nature does it — wide expanses of blue sky and the lush greens of trees and grass always uplift us. And if it’s good enough for Mother Nature, it’s good enough for me. So, when I decorate a room, my pallette of choice inevitably includes some duck egg blue, or eau de nil, some aqua or sea green, or, as my very top choice, turquoise. I’m so known for my love of this striking colour I’ve even been nicknamed Turquoise, and my collection of turquoise jewellery is legendary. 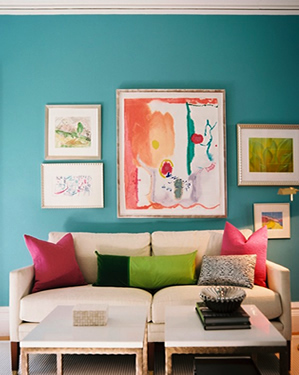 Turquoise is one of those colours like red or lime green that really lifts a room out of the ordinary. I love to dot turquoise accents around a room as an energising visual link, and I dream of having a bedroom polish plastered in turquoise one day. So in honour of my favour colour, here are some wonderful interiors featuring the Queen of Colours – Turquoise. 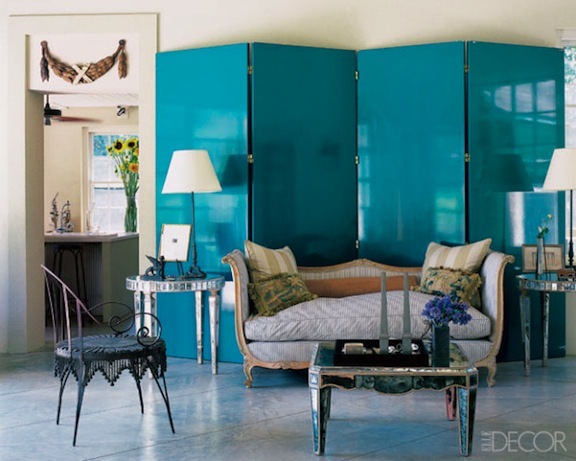 A fabulous turquoise lacquered screen featured in Elle Decor. 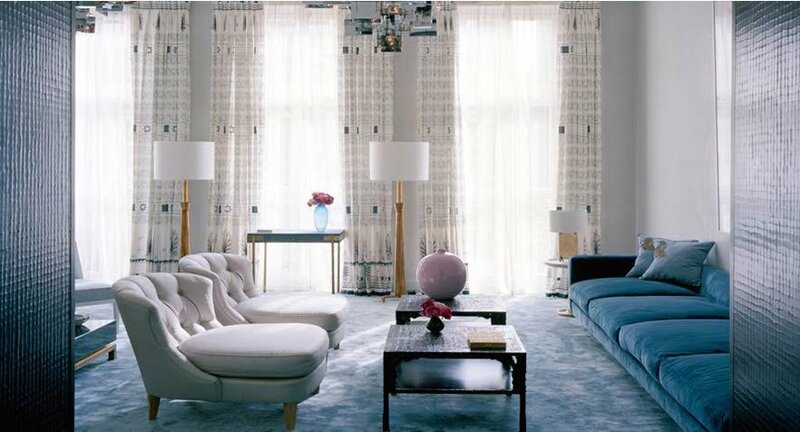 Gorgeous turquoise curtains and accessories in this room designed by Scott Sanders lift this living room into heaven. 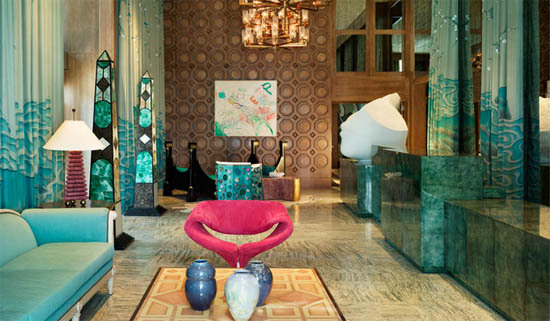 Love the funky retro vibe in this room by Kelly Wearstler. High sheen turquoise walls and silk curtains look great with the graphic animal print carpet and neutral chairs in a room designed by Jonathan Adler. 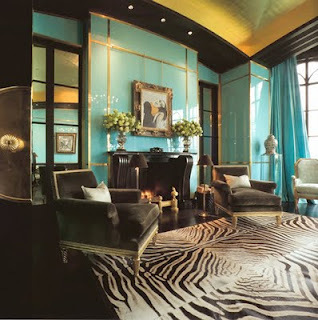 Touches of turquoise look elegant in this room designed by David Collins. My dream room. 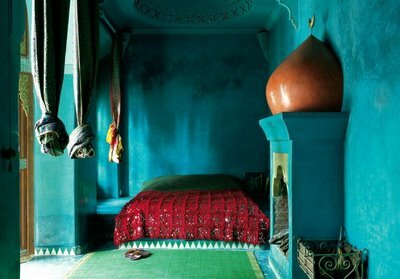 I adore the turquoise tadelakt walls in this Moroccan bedroom. 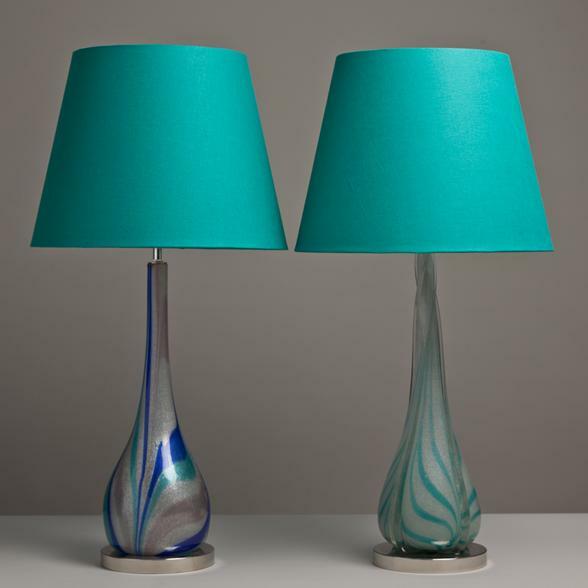 1960s British designer David Hicks knew the value of energetic turqouise as an accent. 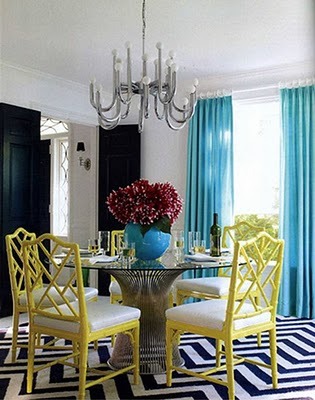 Another fun room from Jonathan Adler. 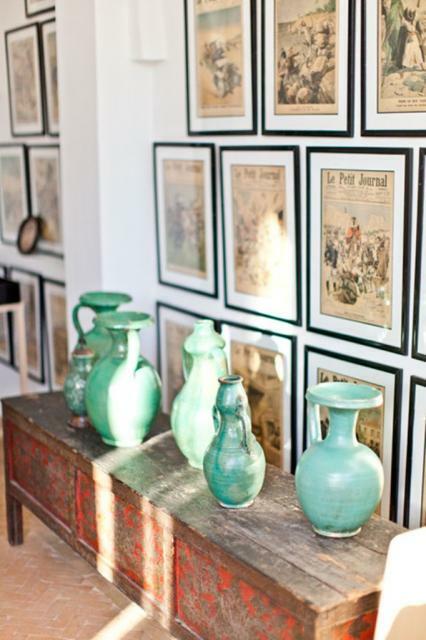 Turquoise pottery looks great grouped together on an antique trunk at Peacock Pavilions in Marrakech. 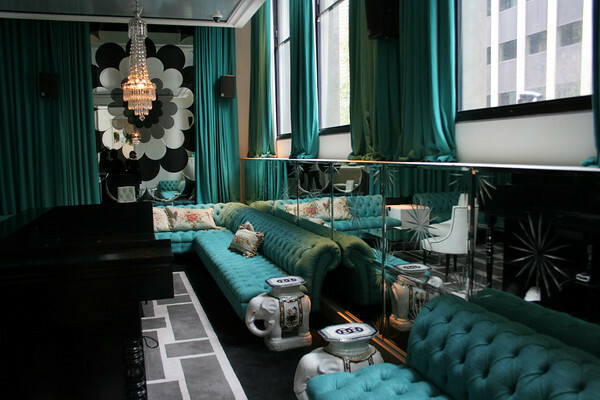 Another wonderful turquoise room by Kelly Wearstler. My own collection of vintage Bitossi pottery. Gorgeous vintage mouth-blown glass lamps from Talisman Antiques in London. 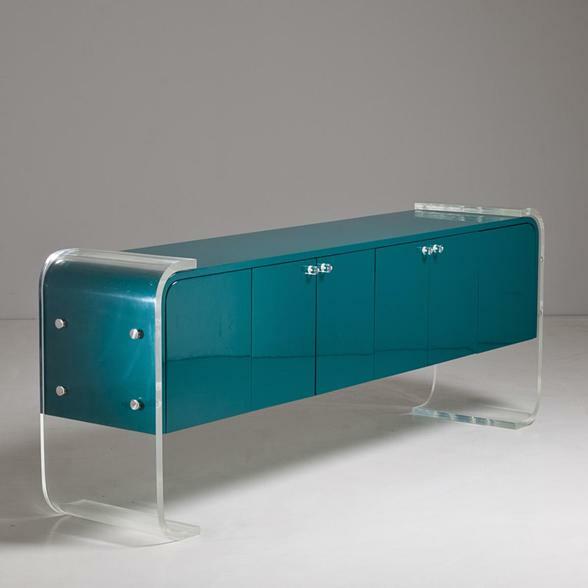 Two of my favourite things in one: Perspex and turquoise. High on my wish list. 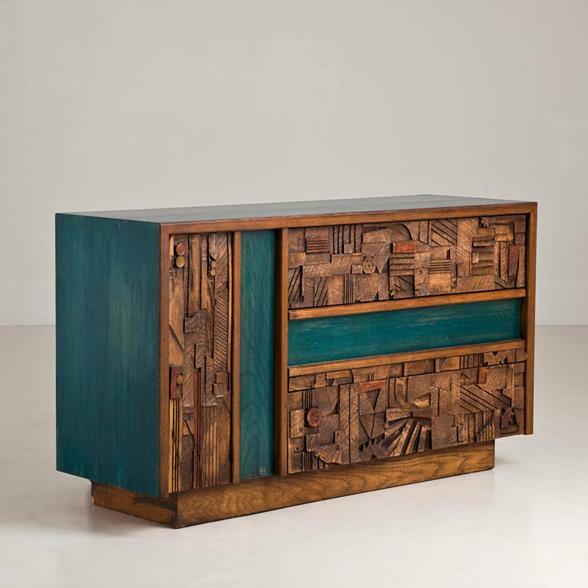 Love the turquoise detail on this vintage mid-century sideboard at Talisman Antiques. 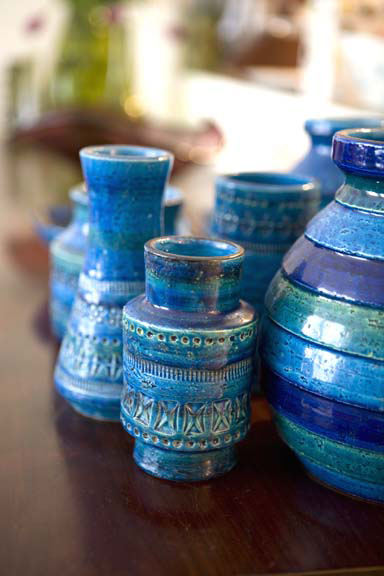 So, the next time you’re thinking of jazzing up your space, why not think of injecting a little turquoise into your life. Just be careful — it’s addictive! This entry was posted in architecture, Colours, Contemporary Design, Interior Design, Interiors, Living Rooms and tagged aqua, Bitossi, blue green, Color, David Hicks, eau de nil, Elle Decor, Jonathan Adler, Kelly Wearstler, Marrakech, Mother Nature, turquoise, Variations of green. Bookmark the permalink. Thanks Anami! Delighted to have you following my blog!